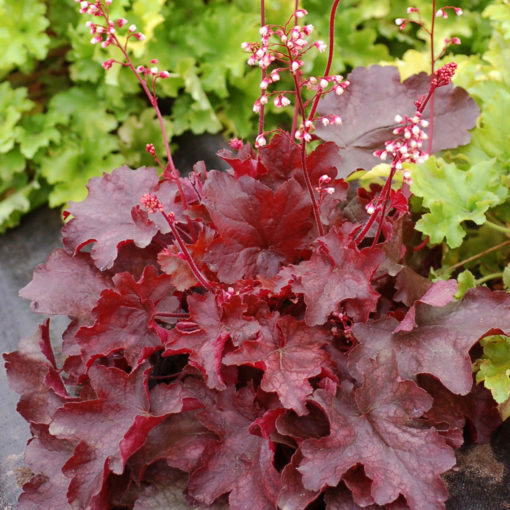 Heucheras can make any garden happier - they are easy-to-grow, colorful, easy to grow, adaptable to sun or shade, great container plants & more! An elegant, very lush, dark foliage with great heat tolerant attributes. Great pink flowers active spring through fall. Mounding growth habit that is most active in spring. Evergreen. Tidy, low mounds of lightly textured, heavily lobed, rich mint green, silver-frosted foliage with burgundy venation. Produces tall, airy panicles of small white flowers. A great choice for adding texture to borders or mixed containers. Tolerates heat and humidity. Evergreen. High impact color with heat tolerance! 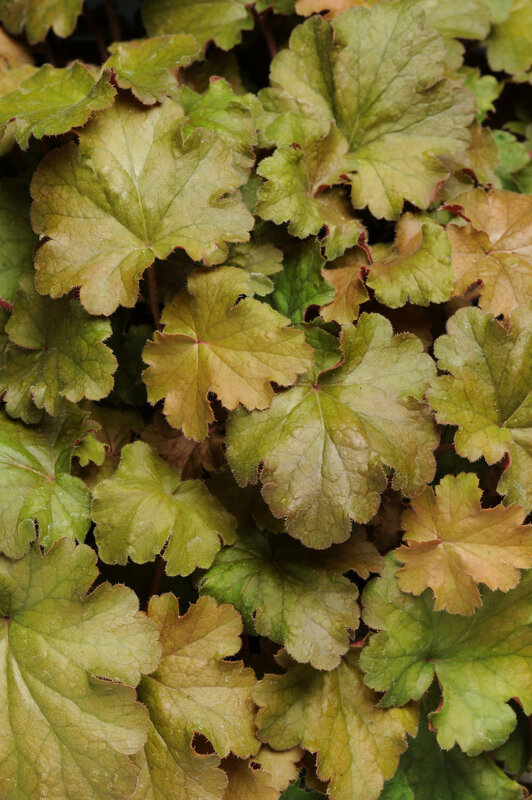 A low mounding plant with warm caramel accents to the large leaves, easily grown in bright or dappled shade, Dainty flower spikes rise above the foliage. Adds contrast and texture to mixed containers or borders. Evergreen. A heat-tolerant villosa hybrid with incredible, high-impact color. Delicate sprays of flowers bloom above dramatic bronze-plum foliage. Nice mounding habit makes great a display in shady beds, borders or containers. Eye-catching foliage in high-impact colors of rich purple laced with silver background between venation. Dainty sprays of white flowers appear in spring. This Carnival selection sports a tidy mounding habit and exceptional heat and humidity tolerance. Evergreen. Create a stunning display with beautifully textured, peach-pink foliage that transitions to a bronze green. Tall, delicate flower panicles dance above the low mounded form in spring. Low maintenance and easy to grow - ideal for borders and mixed containers. Evergreen. 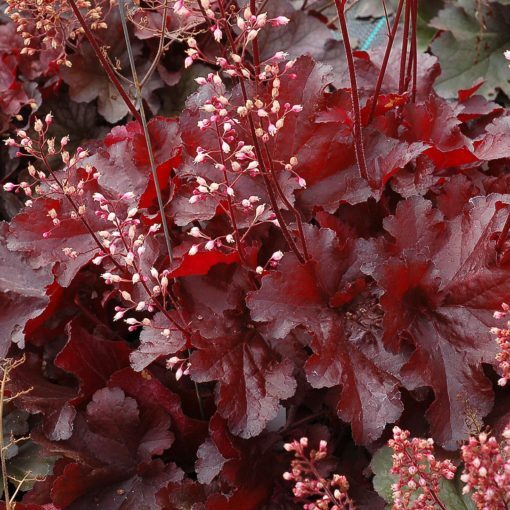 Deep crimson foliage has distinctive curly edges creating a compact, uniform mound. 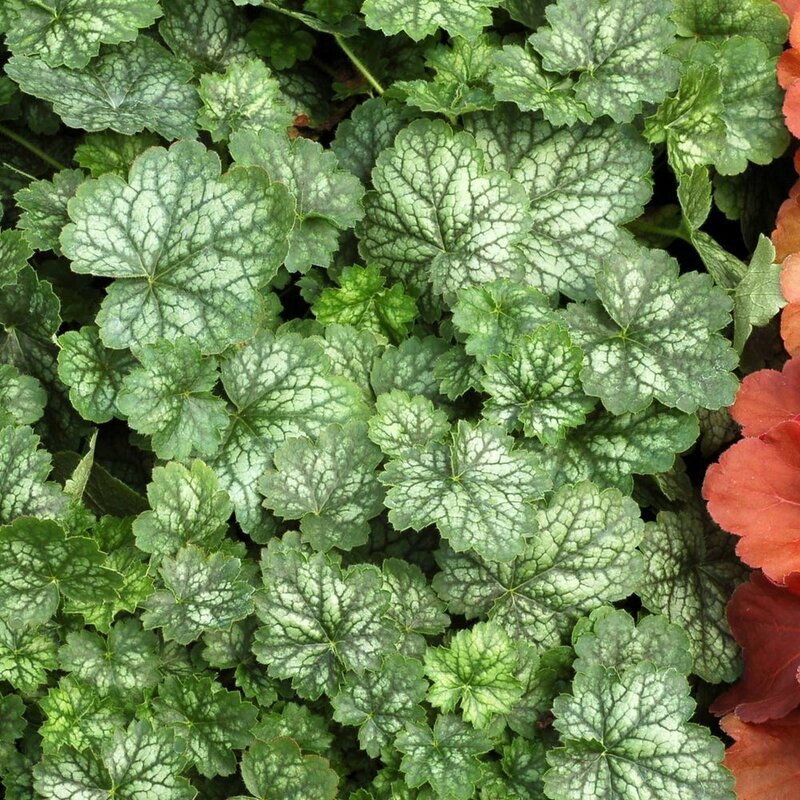 A vivid foliage accent set against green and gray foliage in woodlands and perennial borders. Large, round leaves with red centers in the spring and fall. Red veins are prominent in the summer. The gorgeous gold to lime leaf color highlights the venation. Very showy year-round. A strong, vigorous habit. Best in filtered light or part sun. Bright red in spring and fall, darkens to a brown-red during the summer. Has thick, leathery red leaves that make a delightful medium size mound. Compliments and/or adds beautiful contrast to nearly any other colored companions. Evergreen. 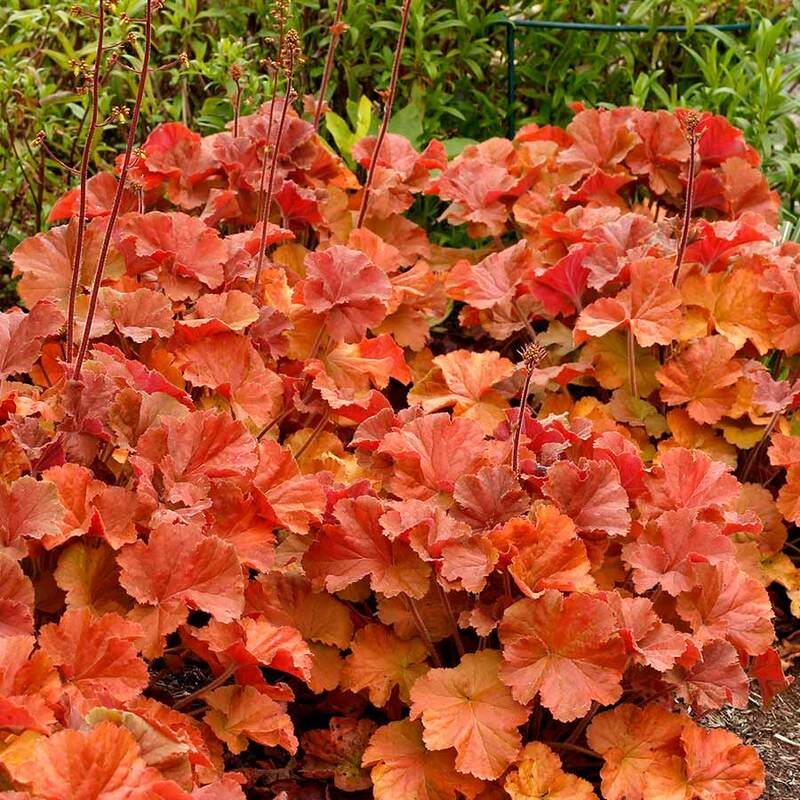 Mid-sized leaves of glowing wine red make a gorgeous medium sized mound. Topped with bicolored pink and white flowers on dark red stems. Foliage turns a little browner in the winter, but otherwise holds its wine red color. Blooms continuously spring, summer, and fall. Evergreen. Appropriately named - this purple is a knockout with ultra-purple glossy leaves with fluted edges and great vigor that stay true to its color all year. Very short spikes of purple-pink flowers in summer. A real show stopper. Evergreen. A vigorous grower with true red foliage. Leaves are cut, somewhat ruffled and reddest in the spring and fall. Tall spikes with white flowers in mid summer compliment and contrast with the foliage. Evergreen. Violet purple foliage with deep burgundy veins form a vigorous but neat clump, accented by dainty pink, pearl-like flowers on slender stems. Silvery hairs cover the top of the leaf, giving it a frosted appearance. Foliage color deepens when cool weather arrives. Evergreen. Glowing peach-colored foliage has a silvery overlay, shifting to rose-purple as the weather cools. Creamy white bloom spikes add to the charm. Performs in heat and humidity. Ideal in rock gardens or mixed containers in bright to dappled shade. More sun tolerant in cool, northern gardens. Evergreen. Green leaves heavily overlaid with silver, featuring purple venation and dark gray edges. Creates a bold color contrast in containers and perennial borders. Excellent foliage for brightening shade gardens. Delicate sprays of tiny white flowers appear in summer. Evergreen. Light peach foliage darkens to warm orange rose, with a silvery overlay. Short, compact, mounded, vigorous grower. Great in containers, for edging, as a specimen or an accent. Evergreen. 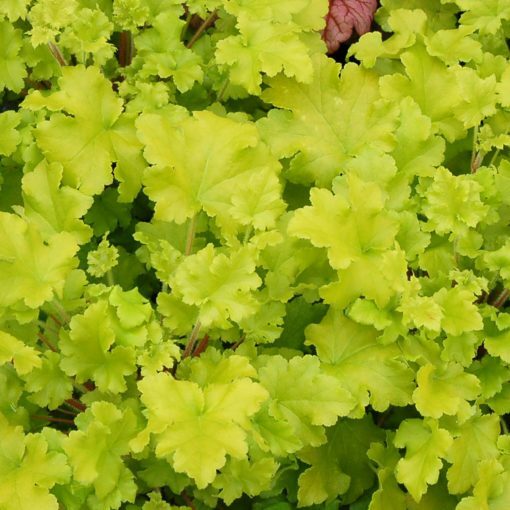 Delectable and frilly, lime-colored foliage is a sure way to brighten woodland gardens, shady borders, or containers. Super vigorous, with a good-sized mounding habit that makes a statement in the landscape. Plant en masse for a stunning effect. Evergreen. Unique caramel colored foliage with delightful flower spikes of mellow, creamy yellow. A blooming machine with many flower spikes at one time. Evergreen. Almost looks like shiny, mahogany-red, beautifully rich leather. Wonderfully dense, ruffled foliage that keeps its color year-round. Purple tones in spring that turn into red tones in the summer. Perfect in combination containers. Evergreen. Dramatic foliage ranges from deep golden hues to glowing reddish pink with undulating margins. Golden mature foliage features hot pink undersides. Sweet sprays of tiny white flowers emerge on vivid red stems. An outstanding seasonal accent for border or woodland garden. Evergreen. Small, white flowers in airy panicles on wiry, red stems above scalloped, evergreen leaves that emerge bright crimson and age to maroon. Great for path edging, woodland gardens and other uses. Evergreen. 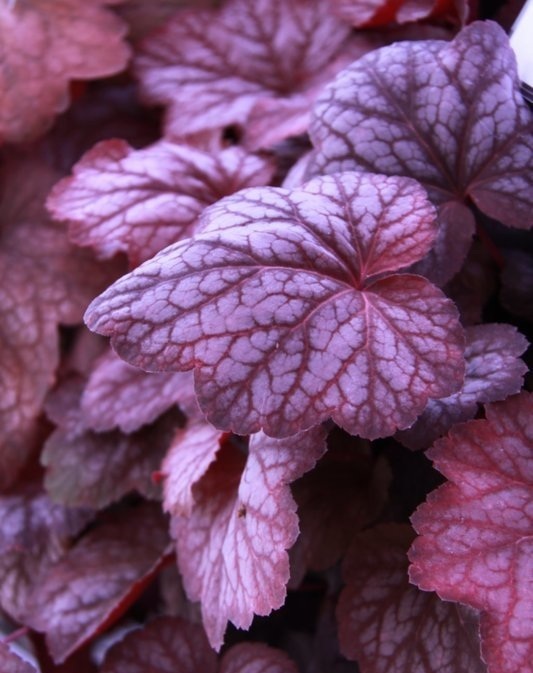 Fabulous burnished black leaves are spotted hot pink in the spring, lightening in summer to cream and pink spots. Outstanding at close range for outdoor living areas and front entry foundation plantings. An exceptional container plant for bold effects. Evergreen. This variety helps create clean lines for the landscape. Clear amber colored, round leaves on a dense, medium size mounding growth habit. A great showy plant with longevity through the seasons. Evergreen. Stunningly black, shiny, rounded leaves hold their color all season. The compact, mounding form offers great opportunities in small urban gardens. Plant en masse to intensify the dramatic color effect. Very striking when paired in pots with high contrast companions. Evergreen. The brilliant deep purple foliage provides a wonderful mass of color and offsets delightful sprays of tiny, white, summer flowers. A great choice for adding color and contrast to borders when coupled with green foliage plants. Evergreen. Large, vibrantly warm, cherry-coral foliage. A very hardy plant that offers tropical appeal. Has attractive white flowers that bloom in spring, during its most active growing season. Evergreen. 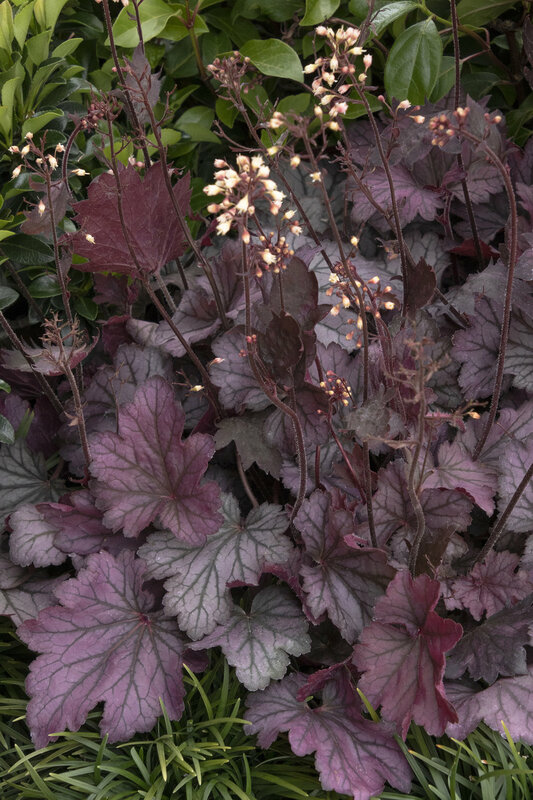 Shimmering plum-purple foliage with metallic silver highlights creates a tight mound and excellent contrast for its sprays of tiny white flowers and for variegated, silver and golden foliage plants. Ideal in rock gardens or mixed containers in bright to dappled shade. Evergreen. 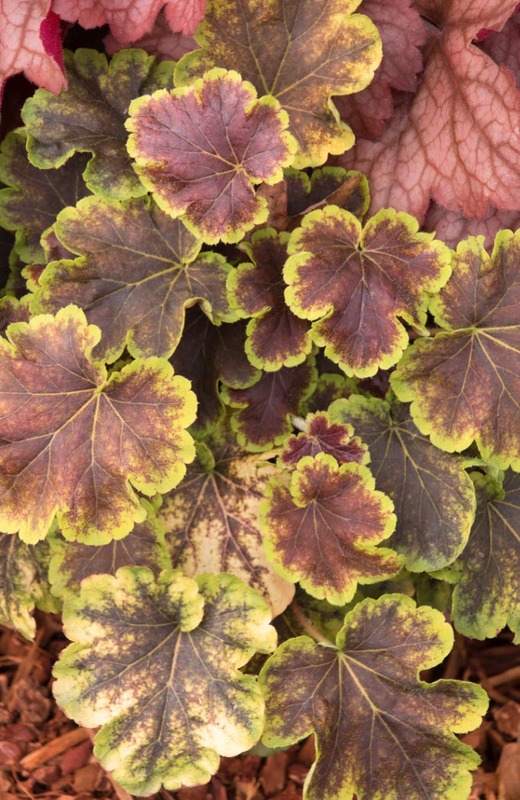 Multi-colored leaves of a rich, reddish brown framed with a pleasant lime green, in combination with broadly scalloped margins, sure to compliment lush containers and beds. Excellent for adding a shot of low maintenance color to the perennial gardens. Evergreen. Vivid yellow foliage with blood red centers brings garden traffic to a standstill in the spring. Summer foliage is pale yellow to green. Stunning color for edging and mixed containers when combined with contrasting darker reds and blues. Evergreen. Undoubtedly, the most intensely colored heucherella ever! Striking orange foliage is emblazoned with huge star-shaped bursts of cinnamon. Big, palmate leaves darken in the summer and lighten in the fall. Great accent for shady woodland gardens, containers, or mixed beds. Evergreen. A showstopper with its brightly colored, dramatically ruffled leaves. Foliage keeps its color well all year and changes from orange in spring and fall to golden amber in summer and winter - always with its magenta reverse side showing. Evergreen. 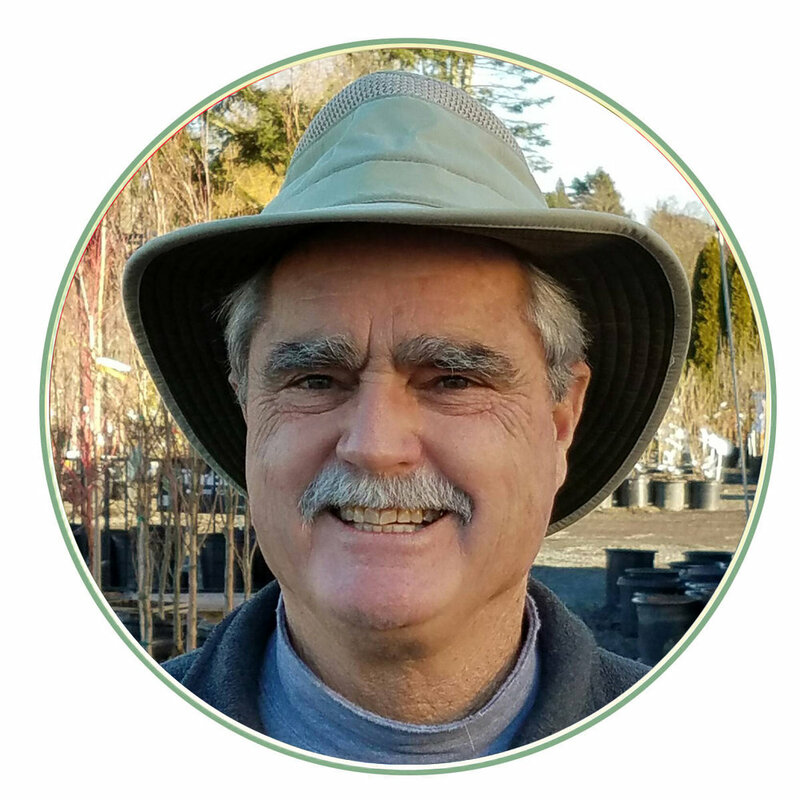 If for some reason you can't find what you're looking for, you can order directly from Monrovia & have it shipped here to the nursery for FREE!